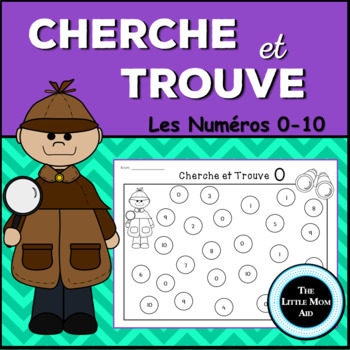 These Cherche et Trouve Les Numéros 0-10 | French I Spy Numbers worksheets are a perfect hands-on activity for your little learners! Reinforce number recognition in a fun and engaging way! 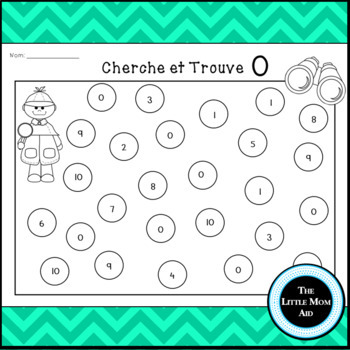 This is activity makes learning numbers 0-10 a blast! Each page focuses on identifying one number. Students are to find the number on the page and color it in. Your students can use other manipulatives to as well such a counting chips, stamps or dab markers. This activity is great for math centers, small group or independent work. This fun number recognition resource can be used in pre-k, preschool, kindergarten and grade one. Also, parents can use this I Spy activity with their children as a part of their homeschool curriculum or to provide their children with additional learning and review.